Today saw the end of the painting and the beginning of the stripping of the door jambs. Used the Speedheater (infrared paint remover) to remove the bulk of the old paint layers and then followed up with a stripper gel. Although not exactly quick, this has proven to be our “go to” combo when we have to strip trim in place. It’s the best way we’ve found to get paint off without sanding (obviously a no-no with lead paint,) but it’s still not very fun! 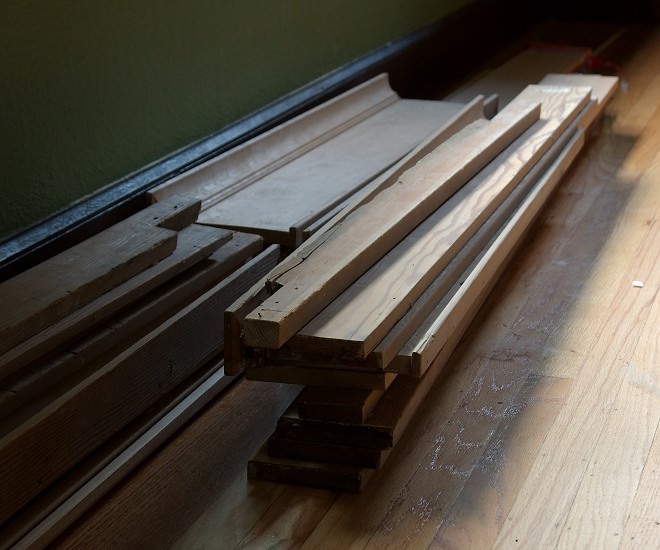 And lastly, here’s a picture of our trim, ready to go on the walls! Some of this was actually taken to be dipped and stripped 4 years ago! It’s been patiently sitting in the basement, ready to return to its rightful place. Most of this pile is original, but the base trim will be new, as will the crown molding.